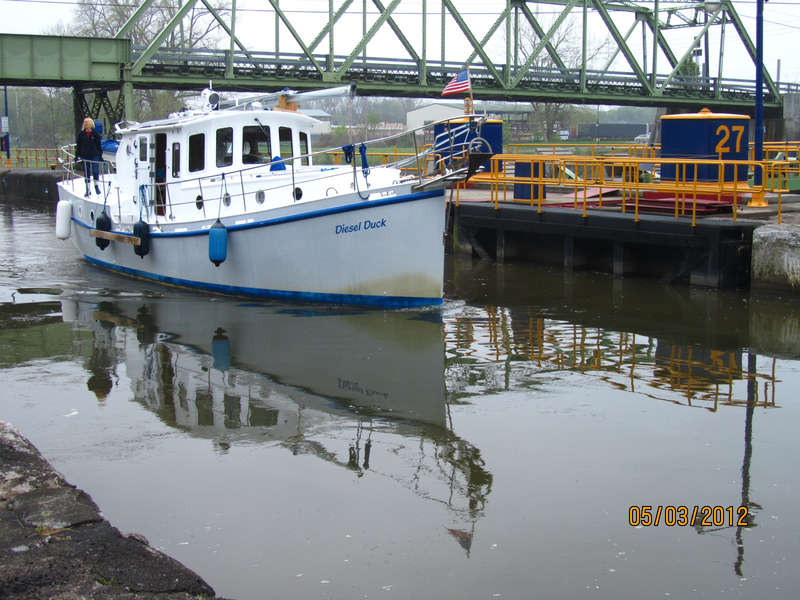 The Diesel Duck 41, piloted by Benno and Marlene Klopfer, is the first 2012 “overnight” visitor at the Lyons Dock on the Erie Canal. The Diesel Duck 41 is an aluminum sail-assisted Troller yacht…. 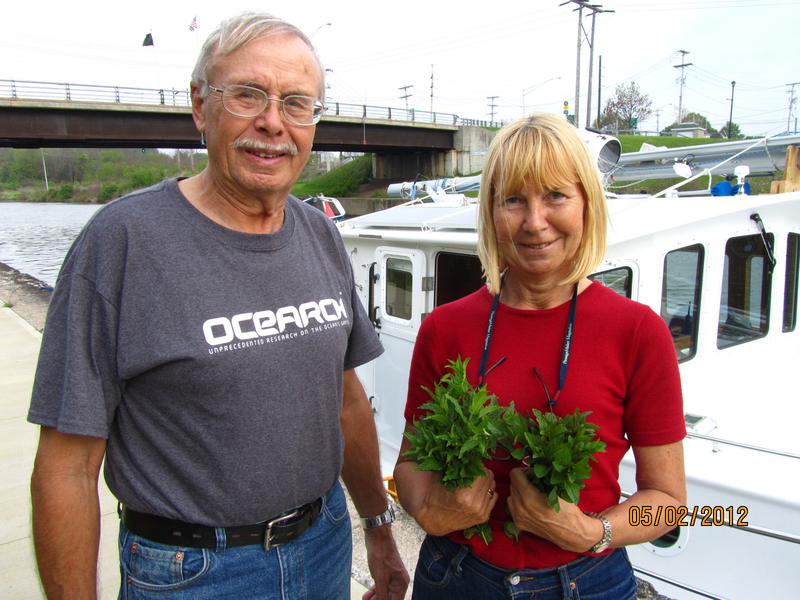 Benno and Marlene, originally from Germany, have an extensive navigational background . With over 45,000 “nautical miles” behind them, Benno and Marlene have literally travelled around the world…. They entered the Erie Canal from the Hudson river and are heading toward their hailing port in Toronto, Canada. While on the Erie Canal, the mast is down, but the Diesel Duck is power-assisted by solar power providing 90 percent of the energy to move the yacht…. According to Benno, “We are quiet on the canal,, and we make no wake– we surprise people– life is good”! World sailors, this is the first voyage for Benno and Marlene on the Erie Canal…. Welcome to Wayne County, New York! 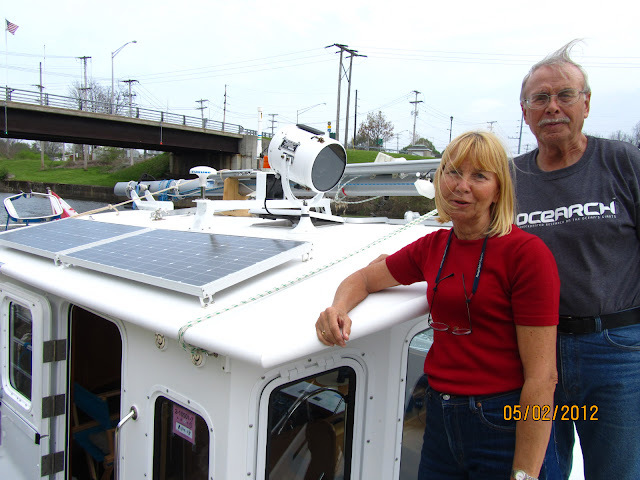 2 Comments to "Diesel Duck 41 on the Erie Canal"
Wow, the Diesel Duck is 90 percent solar-powered--that is impressive.